Looking for a way to recycle at your next community event? Consider the Borrow-A-Bin program. The Borrow-A-Bin program is a free service that aims to maximize waste diversion at events in Tompkins County by loaning up to 20 recycling bins to local events, large or small. Fill out the Bin Request Form. Bins will be available on a first come, first serve basis. Please allow time to process your request. Transportation of bins to and from the event is the responsibility of the event’s recycling coordinator or the bin borrower. Up to 2 bags per bin offered, totaling up to 20 bags per sign-out. Most bins require a 50-gallon trash bag. Assembly and breakdown of the bins are the responsibility of the event’s recycling coordinator or bin borrower. Bins must be returned clean and in good condition within two (2) business days following your event. The estimated attendance for the event. The number of bins you will need for recycling, composting (if applicable), and trash collection. 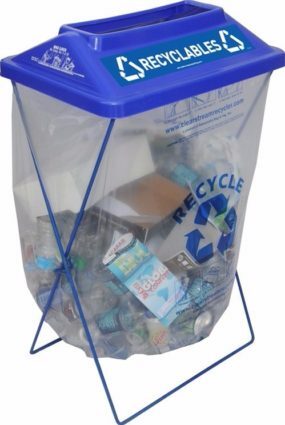 The types of materials you will collect: aluminum cans, plastic bottles, glass bottles, plastic cups, etc. Collecting redeemable containers separately as a fundraiser. Composting at your event – contact us for potential support collecting compost, and Cornell Cooperative Extension to learn about the Compost Education Program. Collection and transport of recyclables to the Recycling and Solid Waste Center (RSWC) after the event. Pre- and post-event press releases featuring the recycling program. Reminders to recycle during the event over a P.A. system. Special shirts for the cleaning crew, advertising recycling.